The state legislature has designated Lexington the "hickory smoked barbecue capital of North Carolina," and that's serious business in a state known for its pork. More than 20 'cue restaurants operate in Lexington  even though the town has a population of just 20,000. So who's eating all that pig? A lot of it gets gobbled up by visitors who come for smoky pork shoulder, often served chopped and dressed with tangy vinegar and ketchup. 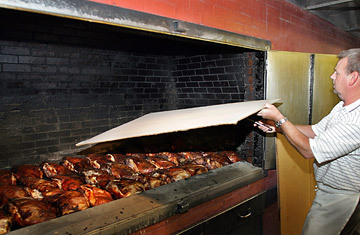 Lexington Barbecue (10 U.S. Hwy. 29-70 S., Lexington; 336-249-9814), a simple roadside shack known locally as the "Honey Monk," is the town's institution and has lines out the door most days, but other nearby restaurants offer an equally good barbecue fix.